Ryu Hyun-jin of the Los Angeles Dodgers rode his luck against the Toronto Blue Jays for his eighth win of the season on Monday. He allowed nine hits, two walks, and struck out three on the road while giving up four runs over five and one-third innings. The Dodgers' line-up was on fire throughout the game, earning 14 runs from 16 hits to beat the Blue Jays 14-5. 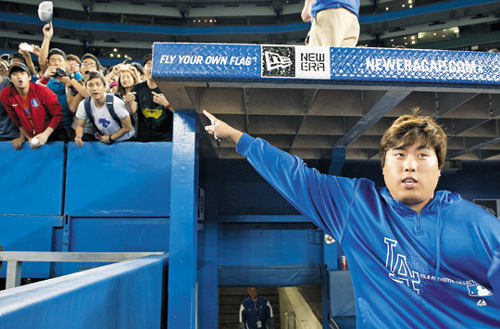 Thousands of Korean residents and expatriates visited the Rogers Centre in Toronto to watch Ryu pitch, with over 1,000 mobilized by a local Korean travel agency alone. Yahoo Sports ran an article titled, "Korean star Ryu Hyun-jin steals spotlight from Yasiel Puig in Dodgers' blowout win over Blue Jays." When Ryu got leadoff hitter Jose Reyes out in the bottom of the first, the Korean crowd erupted into loud cheers that left one broadcaster questioning which country he was in. Toronto has one of the largest settlements of Koreans in North America, with a population of around 200,000. As the Dodgers play in the National League, and the Blue Jays in the American League, the two rarely meet. Monday's game was their first match in six years, and they are unlikely to face each other again in Toronto for a long while. Many Koreans living in the area did not want to miss this opportunity to see Ryu in action, and bought tickets well in advance, or made large group bookings online. Monday's game drew 34,515 people, more than the Rogers Centre average this season of 31,884. After the game, Ryu said, "There were a lot more fans today than I expected, which gave me a lot of encouragement. It felt like I was in Korea when I heard my name being chanted."